Peggy Chew is the American born child of Chinese immigrants and grew up near New York City. After receiving a Bachelor of Arts degree in American Studies at Yale University in New Haven, Connecticut (USA), she decided to follow a path in music. She studied jazz vocals with leading American jazz singers such as: Anne Marie Moss (Manhattan School of Music), Bob Stoloff (Berklee College of Music), Norma Winstone, Lauren Newton. Lessons with the innovative jazz singer Jay Clayton inspired Peggy to explore her individual sound. In the beginning her repertoire concentrated on songs from "The Great American Songbook." Later she expanded the program to include more modern jazz compositions as well as American folk/pop songs she heard in her childhood (eg. the music of Joni Mitchell, Jim Croce). After living and performing in London, Spain and France for several years, she established her base in Switzerland. Here she began her career as a featured soloist of Vince Benedetti’s Jazz Heritage Big Band and a member of his vocal quartet. With the Swiss vocal acappella group "Three Voices and A Tuba," she displayed another aspect of the voice: free improvisation, vocal group improvisation, the use of the voice as a source of sound and textures. Soon, Peggy began leading and performing with her own groups throughout Switzerland which led to the production of four CDs. 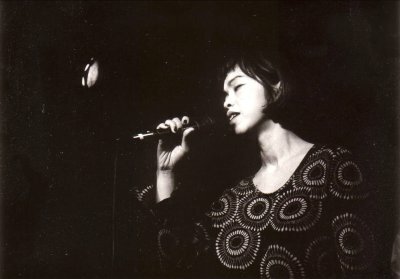 Her debut CD "Detour Ahead" (Shaomei Productions, 1995) established Peggy as a compelling and swinging jazz singer in the tradition of the jazz standards. The second CD "Real Days" (altrisuoni, 2000) opened up new musical territory with a more diverse program. The repertoire’s range included a Chinese song, American folk/pop tunes and modern jazz compositions. An important part of the CD were the compositions of Swiss pianist Adrian Frey sung with Peggy’s lyrics. This recording was well received by critics in Switzerland and abroad. It was honored as "A Selection of Swiss Radio International." Since several years, Peggy has been exploring her Chinese roots. The third CD "Sonic Calligraphy" (altrisuoni, 2004) is the outcome of this artistic journey. The fourth CD "Sonic Calligraphy The Flow of Things" (altrisuoni 2010) was recorded in Shanghai and features special guests, Shanghai jazz singer, Coco Zhao and Beijing gu qin soloist, Wu Na. Festival appearances: JZ Shanghai Music Festival, Culturescapes, Cully Select Jazz Festival, Zürcher Seenacht Fäscht, Jazz Nights Aesch, Jecklin "Red Note" Jazz Festival and altrisuoni Jazz Festival. She has performed throughout Switzerland, in New York, San Francisco (USA), Beijing, Shanghai, Hong Kong (China) and Brazil. Peggy teaches vocals at the Swiss Jazz School in Basel. She sings in English, Portuguese, Chinese and also improvises wordlessly.